Poetry Out Loud is a free national program sponsored by the National Endowment for the Arts and the Poetry Foundation, and administered in Ohio by the Ohio Arts Council. This program encourages students to learn about great poetry through memorization and recitation. For more information visit the national website at www.poetryoutloud.org. Contest Structure. 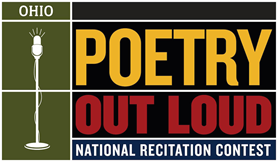 Poetry Out Loud (POL) is free to participating schools. The contest has a pyramid structure, beginning in the classroom and culminating in an exciting national competition with $50,000 in prize money at stake. Participating students compete by selecting poems to memorize and recite from a large online anthology. Their recitations are scored in six categories using a national rubric. Last year more than 8000 students and 100 high school teachers participated in Ohio. Free Teacher Training Workshop. We are offering a free, no-obligation teacher-training workshop, with poet and former POL judge Ray McNiece. The workshop will be held on October 25th at the Memorial Nottingham Branch of the Cleveland Public Library from 4:00 p.m. to 6:00 p.m. The location is 17109 Lake Shore Boulevard, Cleveland, OH 44110. CEU credits are offered. We encourage interested teachers to call or email if they wish to attend. We also accept walk-ins. WORKSHOP REGISTRATION is easy – just contact us by phone at 216.623.2881 or by email at cle.pol@cpl.org. POL aims to expose students to our shared literary heritage in poetry, and to improve their public speaking skills. It also helps teachers meet required NCTE and Common Core benchmarks in close reading, text analysis, and practice with complex texts, speaking, and listening. Choosing and learning a poem by heart, and then interpreting it for an audience, has been a transformative experience for many students, with lasting benefits in their deeper understanding of language.